Island waterfront home located on Vinalhaven, Maine. Spacious new home built at the head of Creeds Cove located on 'The Reach,' about 1 mile from ferry and village. Features front porch overlooking water, hardwood floors, tile floors in all baths, entry and laundry. Open LR, DR, and kitchen overlooking the water. Three large bedrooms, two full baths, and great location. New waterfront home: New home on the ocean. Great location, private but yet close to village and ferry. Enjoy the fresh water quarries, beaches, hiking trails, town parks, and the island life. Enjoy the village and restaurants. Sit outside at the Habor Gawker restaurant and watch the water rush in under the bridge. Cook and entertain on the front deck and watch the boats go by. Great getaway for families and couples. Full bath upstairs and downstairs. Laundry room off bathroom. Vinalhaven is magic. Jay and Rich are kind, generous hosts. The house is immaculate and well built. We simply loved it. Thank you! 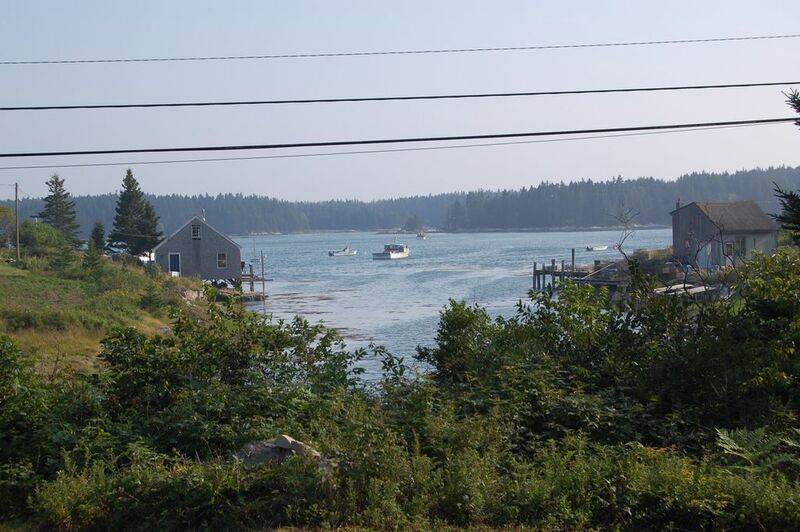 Wonderful summer stay in Vinalhaven! We just loved this place and Vinalhaven too! The house was perfect:clean, comfortable and well equipped. It’s in a lovely location, close to town but quiet and with a nice view. We are looking forward to coming back for a longer stay! Also, the Vinalhaven Historical Society is a must! So much fascinating history there! My friends and I enjoyed staying in Jay’s lovely Vinalhaven rental. It was spacious and very neat and clean. It was well apportioned with everything we needed while I shared many of the beauty spots of the island I grew up on. It was very comfortable for entertaining when family came for freshly caught lobsters or just to visit. Jay was very flexible with our check in and check out to accomodate our ferry car reservations. Kristine thank you for your feedback. We are glad you enjoyed your stay and hope to see you again. The house is simple, clean and uncluttered and had everything we needed to feel at home. The kitchen has plenty of dishes and pots/pans. Also more than enough sheets and towels. It’s a good location. Close to drive to the quarrys and the state beach and easy to get to the hiking trails. The owners are super friendly and accommodating. Call them if you want lobster right out of the water! Thank you for your review. Glad that you enjoyed our home and Vinalhaven. Hope to see you again. Overall, an excellent stay. This 3 bedroom, 2 bath house was a much, much better alternative for my family than the local hotel for the same cost. Had we stayed longer than 2 nights, the full kitchen, laundry room and the ability to entertain friends on the front deck would definitely have made this the ideal place to stay on the island. Jay provided excellent directions, advice for accessing the ferry and recommended an excellent restaurant for dinner the night we arrived. I would highly recommend calling and talking to him before you leave. One of the upper rooms has 3 twin beds, good for kids. The upper master bedroom has a queen bed with good mattress and lots of space that overlooks the coastline. The ground floor has a queen bed with hard matress. The ground floor has an open floor plan that includes a kitchen, island, dining area and living room with 2 couches. Lots of room! The place was pretty spartan. No pictures on the walls or window coverings to give it a more homey feel. You also need to make sure you bring your own paper products (yes, TP too). Also be prepared to make the beds and strip them before you leave. However, Jay did give us clear directions beforehand, so that was really no big deal. Would I do this place again? Definitely! We spent three nights in this beautiful home and loved every minute of it. The house is not far from the ferry by car and has great views from the deck, living room and bedroom. The kitchen was adequate for cooking. We made all of our meals at home. The place was clean and comfortable, with cable TV and heat if we wanted it. Jay was available to answer questions we had about the house. We would definitely stay again.